I started my new job last week and it is going wonderfully! But it is not leaving me much time for reading and I haven’t adjusted my borrowing habits accordingly. Still, maybe having lots of books standing by will motivate me to work more reading time into my new, busier schedule. Here’s hoping! Drawn from Life by E.H. Shepard – after reading about Shepard’s childhood in Drawn from Memory, I’m really looking forward to hearing more about the later stages of his life. Endgame, 1945 by David Stafford – a history of the final three months of the war, focusing on the personal stories of nine men and women. The Duchess War by Courtney Milan – I’ve heard excellent things about Milan’s romance novels and, after reading one last month, I’m happy to try another. 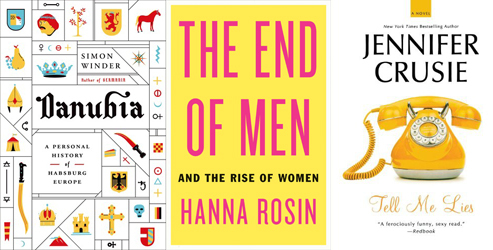 The End of Men by Hanna Rosin – given how often Rosin is quoted in magazines and articles, I suppose it is time to see if her book is really as controversial as its billed to be. Tell Me Lies by Jennifer Crusie – Maddie was coping pretty well with the adultery, the embezzlement, and the blackmail. Then her old boyfriend came back to town. 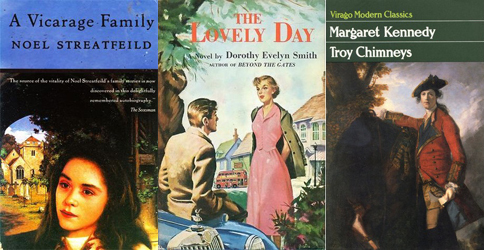 A Vicarage Family by Noel Streatfeild – the first book in Streatfeild’s fictionalized autobiographical trilogy. The Lovely Day by Dorothy Evelyn Smith – no idea what this is about, but isn’t the cover pretty? Troy Chimneys by Margaret Kennedy – since reading Lucy Carmichael, I’ve been looking forward to reading more Kennedy and Hilary’s review made this sound excellent. A Table Near the Band by A.A. Milne – I haven’t read anything by AAM in far, far too long. Welcome to Temptation by Jennifer Crusie – Sophie came to Temptation, Ohio to help her sister make a movie. Now she’s making trouble for the town council, love with the mayor, and lemonade for a murderer. The Finishing Touches by Hester Browne – a fun reread. Year Zero by Ian Buruma – A history of 1945 (yes, another one). The Baker Street Letters by Michael Robertson – First in a spectacular new series about two brother lawyers who lease offices on London’s Baker Street–and begin receiving mail addressed to Sherlock Holmes. The New English Garden by Tim Richardson – This is the pretty thing I’ve seen in a long, long time. I might have to buy my own copy after I return this to the library. Ooh! Welcome to Temptation is really good! And I’ve had the sequel, Faking It, on my shelf for ages but haven’t read it yet. Oooo…I just filled up my interlibrary loans in about two minutes after reading this post. I’m linking up for the first time today! Oh, love those Jennifer Crusie titles and Courtney Milan is always a winner. Welcome To Temptation is one of my favorite Crusie books. Enjoy! Oh wow. If you’re just discovering Jenny Crusie, you’re in for a huge treat. Welcome to Temptation and Tell Me Lies are pure joy. Agree with everyone about Crusie. I am not a contemporary romance reader at all, but her books are delightful. What a fun pile of “loot”. The Baker Street Letters have appeared on my radar screen, and, of course, anything about English, or any other gardens are always a diversion for me. And The Lovely Day has a lovely evocative cover! Tell Me Lies is a favorite Crusie. I didn’t know Vicarage Family was autobiographical. Great loot. So many good picks! Tell Me Lies sounds really interesting. Happy Reading! The Vicarage Family is the one that caught my eye. Very glad to see more AAM! I’m about to re-read his autobiography. I love Noel Streatfeild! Looks like you have quite a haul there! Danubia looks fascinating, but also quite the chunkster. I’ve been slowly working through a history tome for the past few months, so though I want to read Danubia someday, maybe it will have to wait for a while. Danubia, Endgame and Year Zero look great! Cant wait to read your reviews!